Harvey Art Projects in conjunction with Mimili Maku Arts is proud to present this very special exhibit from the women artists of Mimili Maku Arts including founding member artists Milatjari Pumani and Kunmanara (Kathleen) Injiki Tjapalyi. Antara is an important ceremonial site northwest of Mimili Community, and home to the Maku Tjukurpa (witchetty grub story). The artists in this exhibition share a deep knowledge and understanding of the stories of Antara. This Tjukurpa has been passed through uncountable generations through inma (song and dance). 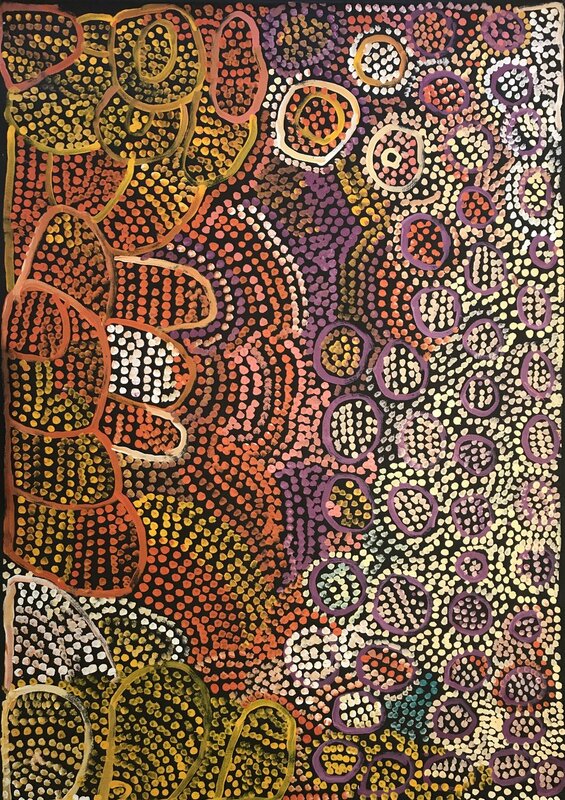 Today, a handful of senior artists at Mimili Maku Arts have found their unique visual language to express the importance of Antara. Ngupulya Pumani, Puna Yanima, Tuppy Goodwin, Betty Kuntiwa Pumani and Marina Pumani Brown paint alongside each other in memory of their mother and auntie Milatjari Pumani and Kunmanara (Kathleen) Injiki Tjapalyi, who shared the cultural knowledge of Antara with them. Ngupulya, Puna, Tuppy, Betty and Marina live in Mimili Community, home to 300 Pitjantjatjara and Yankunytjatjara people who have been living in the area for millennia in harmony with nature and acting as custodians of the land and the Tjukurpa. They still go to the kapi tjukula around Antara and sing inma for maku tjuta. Mimili was formerly known as Everard Park, which was a cattle station that was returned to Aboriginal ownership through the 1981 AP Lands Act. Mimili Community was incorporated as an Aboriginal Community in 1975. This exhibition features works from the estates of Milatjari Pumani & Kunmanara (Kathleen) Injiki Tjapalyi. Harvey Art Projects gratefully acknowledges Mimili Marku Arts Manager Anna Wattler and the extraordinary women (both past and present) in mounting this special exhibit honoring the mothers, sisters, aunties and granddaughters of Mimili Maku Arts.